Sognefjord is the most impressive of fjords of western Norway. The sight of this huge, deep, steep and incredibly beautiful fjord can not be accommodated in a range of human sight, it is among the most deep, steep and beautiful fjords in the world. Sognefjord is one of the 200 major fjords that make the west coast of Norway that looks like a torn flag in the wind. The water inlet of Sognefjord has a depth of 170 m and inland is increased by several times that depth. Besides the 204-km. Sognefjord, the longest fjords in western Norway are: Hardangerfjord (179 km), Storfjord (110 km), Nordfjord (106 km) and Romsdalsfjord (88 km). In some places Sognefjord is deep more than 1300 m. In part it is that the surrounding mountains are so high, reflects on how deep is the fiord itself. Sognefjord is surrounded by a railway line, which is one of the nicest tourist attractions in the area. However, a boat trip on the water remains unsurpassed, which lasts several hours and which reveals details of the majestic beauty of this icy mountain. Tourists have the opportunity to experience this untamed nature, though even here on the small islands in the fjord humans are living. In Sognefjord, in many places descend thin streams that are formed by melting snow on the ridge. Liners look like toys into Sognefjord, shrunken beyond recognition from the surrounding countryside. The mountains rise almost vertically from the lake waters and in places steep cliffs of solid granite are found, reaching a height of 900 m.
On the more gentle slopes pine trees can be seen in those areas where their roots fail to engage in rock crevices or on hills formed by scree. 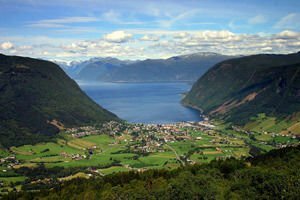 In fertile strips of land on both sides of Sognefjord can be seen scattered farms which do not violate the sense of harmonious nature. This deep bay formed by the action of glaciers has low tides and is calm as a lake. Its widest part is 5 km and depression, as measured above and below the water level is 2100 meters - almost 600 meters deeper than the Grand Canyon in USA. Granite mountains around Sognefjord are 2 billion years old. About 50 million years ago, rivers going through them began to dig valleys and through several glacial periods on the same path descended glaciers as well, which further carved valleys. By the end of the last glacial period 10, 000 years ago, the glaciers retreated and sea water invaded and met the valleys. Valleys carved by glaciers are in the shape of a horseshoe, steep walls and usually are deeper in the middle rather than in its mouth. Sognefjord is also no exception - the water inlet is at a depth of 170 meters and even deeper up to Vadheim, located 50 km inland. Melting glaciers affect the water temperature of Sognefjord even in summer. Norway is located on the same latitude as Alaska and Eastern Siberia, and the fjord is located just 800 km south of the Arctic Circle. But over the North Atlantic (Gulf Stream) brings heat from the Caribbean coast line and the climate is favorable for the cultivation of apple trees near the town Leikanger. Near the mouths of rivers flowing into the fjord are also formed several lowland areas where settlements have sprung up, such as Zogndal and Lærdalsøyri. Aurland is an industrial center-city with a large hydroelectric plant and a plant for production of aluminum. In the summer Sognefjord attracts thousands of tourists who come to enjoy the magnificent scenery, culminating in the National Park Yutunheymen. One of the greatest attractions in it is the Vetis waterfall, which descends 275 m into Ordalsfjord, the eastern branch of Sognefjord.